Gather up your girlfriends to relax and reconnect at our cozy hideaway near the coast. Whether you’re celebrating a bride-to-be, meeting up with old friends, or just looking for an escape from the city, our luxury bed and breakfast in Monterey is a perfect place to stay. Our ideal location offers a safe & quiet respite, just a few minutes walk from downtown and everything it has to offer like shopping, dining, and fun. Our expansive manicured gardens are the perfect place to enjoy your included gourmet breakfast or gather in the afternoon with complimentary drinks and appetizers during our social hour. See all the fun things to do in Monterey as you read on. 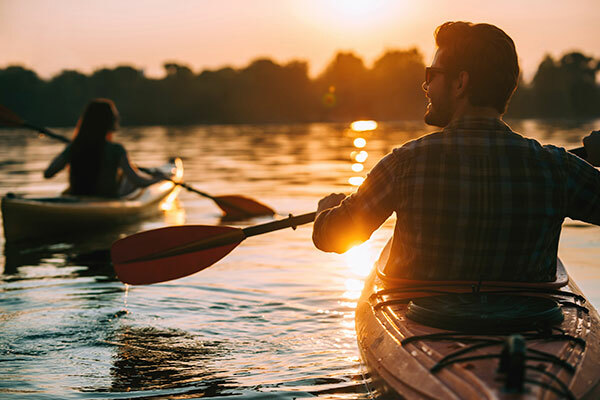 If you’re an active couple that likes to combine romance and outdoor activities in a beautiful location, try couples kayaking along with a stay at our charming Monterey bed and breakfast. It’s the perfect balance of adventure and relaxation, and the makings of the ideal romantic getaway. 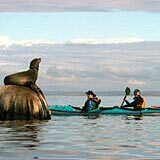 Well, I just sent a few of our Monterey Bed and Breakfast guests to go Sea Kayaking out at the Monterey Bay National Marine Sanctuary and decided with the warm weather we are expecting this week and weekend, it was perfect timing to write a few words about! We like to send our guests to the Monterey Bay Kayak company (very helpful and friendly) and there are two main locations you can paddle your kayaks from. One location is out on the Monterey Bay, starting at Monterey Beach by Fisherman’s Wharf, and the other location is the Elkhorn Slough in Moss Landing about 20 minutes north of our Monterey Bed and Breakfast. The Elkhorn Slough is the location I have paddled from, and as a beginning kayaker I must say it was absolutely fabulous! The kayak company provides all of the equipment, right down to the waterproof pants and jackets (your feet will get wet though!) and instruction on the beach before you set out. The Slough is one of California’s last remaining tidal estuary reserves, and wildlife is everywhere! The water is crystal clear and calm (and not nearly as cold as I thought! ), and the scenery is beautiful! We had sea otters popping up right next to our kayaks, harbor seals sleeping in the sun all along the shores, sea lions barking on the docks and swimming all around us. It is a very fun and memorable experience to take in during your stay at Old Monterey Inn! We have a great kayak package available at our Monterey Bay Bed and Breakfast, and we would love to see you soon!